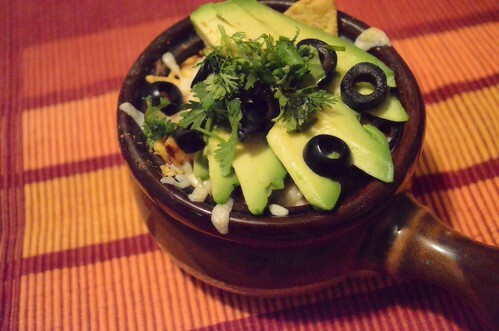 I wrote about How to Fancy Up your Guacamole over at the Taco Cleanse blog. Check it out and preorder the book. This entry was posted in Cooking, recipe and tagged Avocado, fancy, Guacamole, taco cleanse, tacos on September 16, 2015 by lazysmurf. 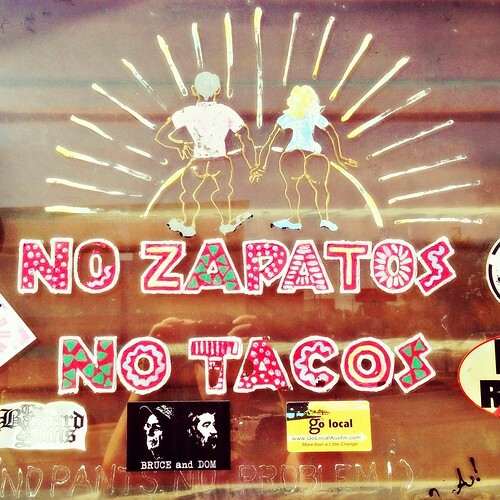 I’ve been so busy working on the Taco Cleanse lately that I’ve not blogged here as often. 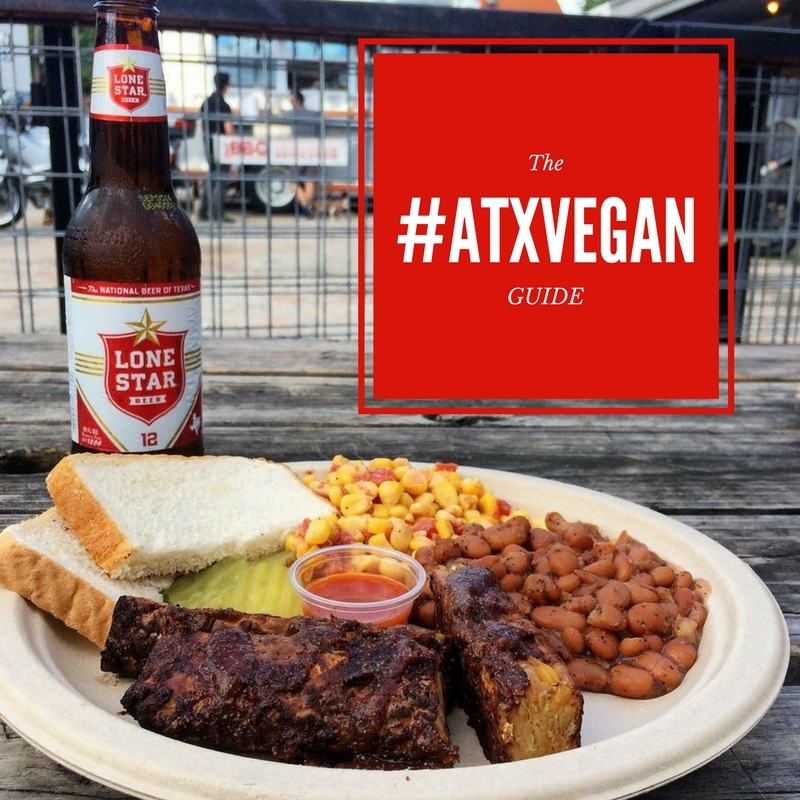 Don’t worry, I’m still keeping the Austin Vegan Guide as updated as I can! 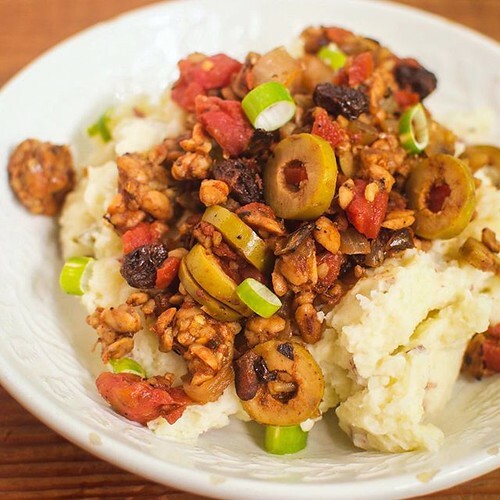 I’ve been busy testing recipes like this Tempeh Picadillo from the book and creating recipes for the Taco Cleanse blog like the Mexican Smashed potatoes underneath. 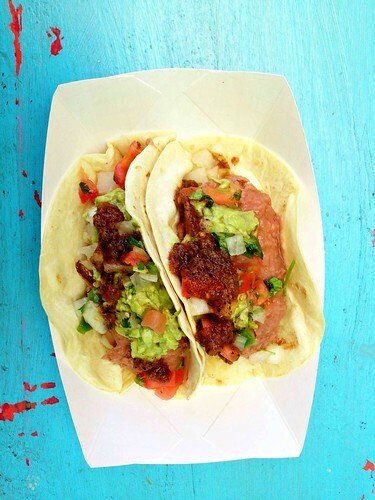 Follow the Taco Cleanse on Instagram, Tumblr, Twitter, Pinterest and Facebook too! 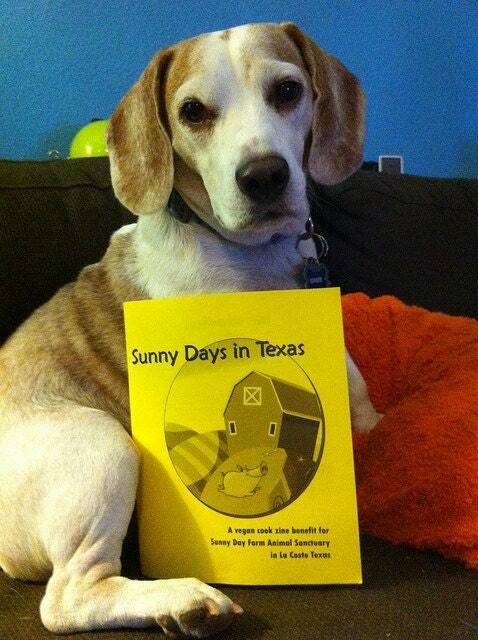 And don’t forget to pre-order the book, it’s on sale at Amazon! This entry was posted in Cooking, recipe and tagged taco cleanse on July 15, 2015 by lazysmurf. Wasota is one of my favorite trailers in town. I love everything there… maybe a little two much. All the food is so good and the portions are so humongous that Dan and I both eat well past our stopping point whenever we get it. We try to stick the leftovers in the fridge but then we can’t stop snacking on them. It’s addictive. During the taco cleanse I realized that the vegan platter would make great vegan tacos, it has so many different elements and there is even a tasty spicy sauce to put on the top. I thought about this constantly until a night when Dan and I were both home because I couldn’t go to Wasota without him. Putting everything together was even better than expected and we only had to get one vegan platter (with an extra side of plantains) to split. We still ate more food than we probably should of but it was delicious magical food. 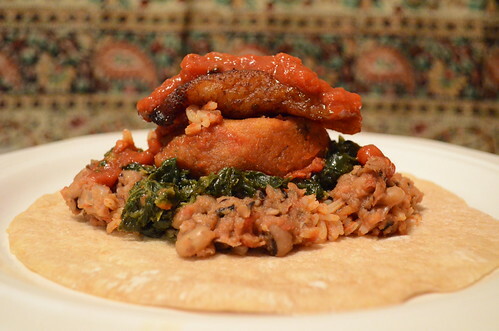 The taco was Jollof rice, black-eyed peas, creamy spinach, akara fritters, fried plantains, and then topped with the spicy Benin sauce all in a flour tortilla. If you haven’t been yet, I highly recomend you check it out stat. They recently moved the trailer to South Lamar in that little lot across the street from Mr. Natural. 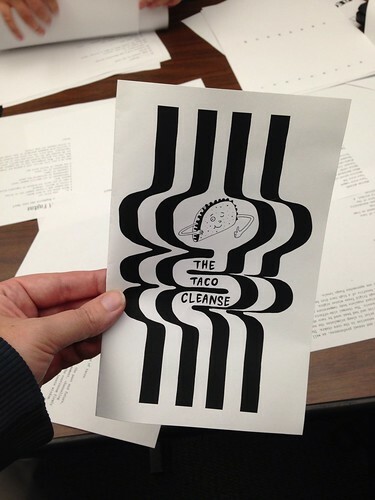 In other taco cleanse news the zine is now available on paper and on PDF. A warning about the latter, we made the zine all with cutouts and photocopies so the PDF version is just a scanned version of the paper version. It still rocks! The paper version is going to be a limited run and will also be available at Rabbit Foods pop-up at Vegan Drinks this Friday. 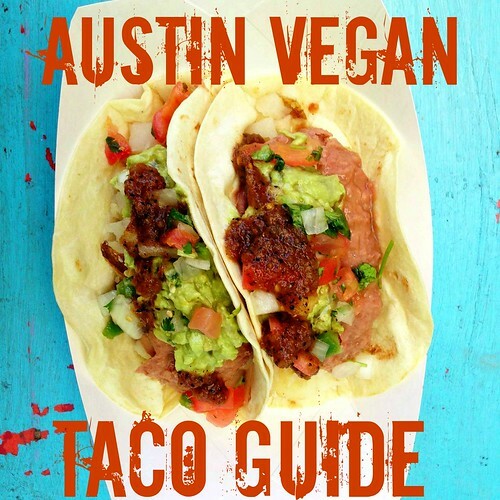 This entry was posted in Cooking and tagged Austin, Nigerian Taco, taco cleanse, tacos, vegan taco, Wasota on October 3, 2013 by lazysmurf. These days it seems like ramen joints are popping up like mushrooms after a rainstorm but a couple years back it was all about the Korean Taco fusion trailers. Only one stood the test of time, and for good reason. 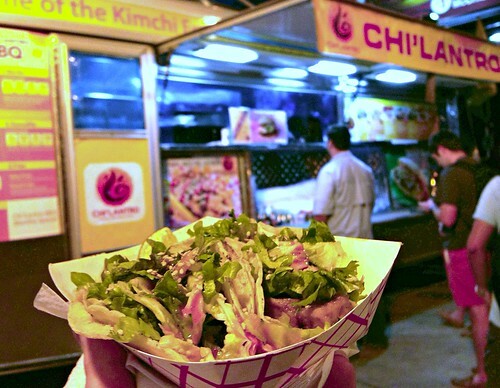 Chi’lantro might be the best run food truck – or really fleet of food trucks – in the city. They are completely on it with social media telling you on twitter where they have moved too, and the mobile trucks always seems to be exactly where I want them to be when I’m looking for food at 2am after the bars close downtown. These tiny tacos of deep fried tofu, soy vinaigrette Korean salad, cilantro, onion, and their special salsa are the ideal late night food. Everything comes together perfectly and the sweet sauce covering the salad is just delicious. And they are only a couple of dollars! The service at the trailer runs with more efficiency than, I’d say, ANYWHERE else at 2 am. I promise you will have a better experience than at Taco Bell or Kerbey Lane. The only thing I don’t like is that their Kimchi isn’t vegan and neither is their magic sauce so I can’t partake in what I’m sure are amazing Kimchi fries. I want them every time. Oh well, I’m still always happy with two tacos in my belly for the ride home at the end of the night. 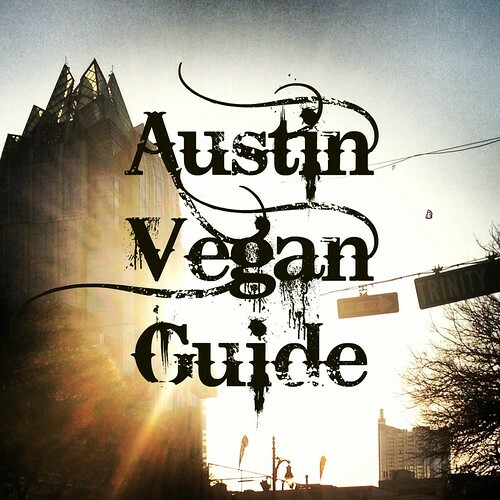 This entry was posted in Austin, Austin Restaurant Reviews and tagged Austin, Chi'lantro, korean, late-night, taco cleanse, tacos, vegan, vegetarian on October 2, 2013 by lazysmurf. Breaking the Cleanse – Where do we go from here? I have started to break the taco cleanse. Dan made the Siesta Taco Soup from Betty Goes Vegan yesterday (except we used hominy instead of lentils and topped with avocado) it was so delicious. It was strange to feel something so soupy in my belly but it had all the comforting flavors of a taco so I think it was a good choice. But now I’m really confused about what to eat. I went to the grocery store on Sunday and just kind of wandered around and ended up with just stuff for Dan. Basically I can’t imagine cooking something that isn’t a taco. I guess I’ll just wait for a craving. Any suggestions? I’ve had “where do we go from here” from Buffy the Musical in my head since the end of the cleanse and I wanted to add the you tube of the video. I couldn’t find it, but I did find a version of the song cut to the mid season finale of Battlestar Galactica. I swear when Lee Adama said, “where do we go from here” I totally thought they were referencing this song which is possible since Jane Espenson wrote for both shows! If you love both of those shows or you want to understand what I’m feeling, check it out. This entry was posted in Cooking and tagged Battlestar Galactica, Betty Goes Vegan, Buffy, Siesta Taco Soup, taco cleanse, VeganMoFo on October 1, 2013 by lazysmurf. Yesterday I stopped in at one of my former constant hangout’s Maria’s Taco Xpress. I used to live down the block so we would go there all the time. It’s crazy how much it’s changed in the last few years. It used to be a little shack with some tables in the back on the dirt and a trailer park behind it. Then Walgreens bought the land and, I think because of the neighborhood outrage, they let the Taco Xpress rebuild and rebuild it they did. The new location is so much bigger, and then they expanded the patio! Then they expanded it more. Then they added a second story! The trailer park gave way to super modern condos and the whole area looks completely different. The tacos however remain exactly the same. The thing I really love about Maria’s tacos is the range of salsas and topping that they carry. You can dress your taco with pico, red salsa, green salsa, cilantro, onions, and maybe some other things too. If you go, pay extra for the guacamole, it’s always perfect. The atmosphere is always fun but especially Sunday brunch when Hippie Church is going on and there is live gospel music and dancing. 100% south Austin charm, even if it is in the middle of what seems like thousands of condos being constructed on South Lamar. Last night the Taco Scientists worked into the night putting together the zine. If you want a hard copy go pre-order on Rabbit Food, we are just going to do a limited run. You can also get them at the Taco Cleanse Closing Party this Sunday! 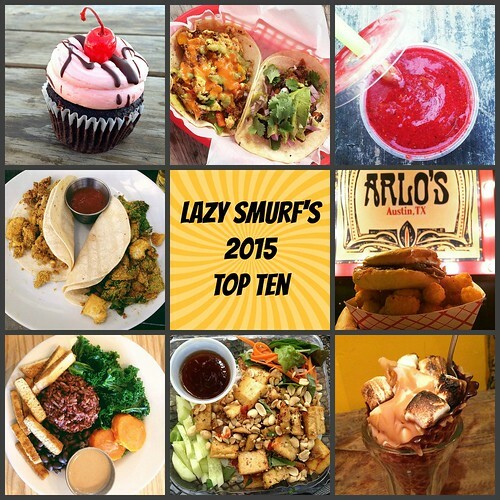 This entry was posted in Austin, Austin Restaurant Reviews and tagged Austin, Maria's Taco Xpress, taco cleanse, tacos on September 27, 2013 by lazysmurf. 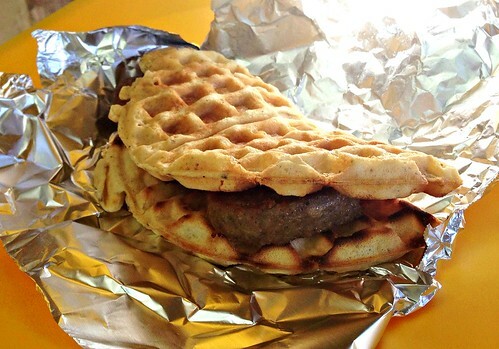 Taco Cleanse Day 26 – The Waffle Taco + pre-order information for our zine! The first time I read the words “waffle taco” (I believe it was on twitter via @pandawithcookie) I knew I had to check it out. Since my first trip to the Flavor Spot in Portland I’ve gone back for more many times but it never even occurred to me to make my waffle taco. I figured it could never compete with the perfection that is Portland’s own dutch taco. Fast forward a few years to the founding days of the taco cleanse. I was meeting with the taco scientists here in Austin and we were discussing all the different tacos we could do. Knowing that fellow scientist and Taco Liberation Front writer #westagram had made waffles in the past and is an amazing cook I asked him to make us waffle tacos later in the month. While I watched his experiments on instagram I was jealous but when I finally got to try it, the dutch taco was worth the wait. In fact, I think it was even better than the flavor spot. A dutch taco is a sausage with maple cream sauce encased in a folded waffle. You know that thinspo saying “being thin feels better than any food tastes” or something? Those people have never had one of these. My level of happiness was off the freaking charts after eating it along some with some mimosas. It’s all breakfast was ever supposed to be. The good news is, if you don’t have a Wes in your life you will now be able to make his tacos at home because the recipe is going to be in our fabulous upcoming zine! 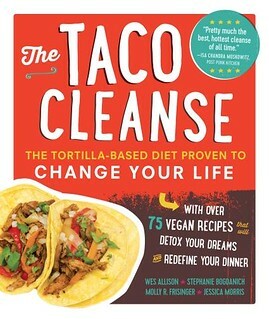 The Taco Cleanse official zine is going to have a lot more than just recipes too, there are going to be quizzes if you are wondering if taco cleansing is right for you, taco crossword puzzles, and even a forward from Vegansaurus founder Laura Beck! Pre-orders are available at Rabbit Food and we are hoping to have a whole lot to sell at the taco cleanse closing ceremony this September 29th! We are super excited! I can’t believe the taco cleanse is almost over. My sister asked me yesterday if I still know how to use a fork and you know what, I don’t want to! This entry was posted in Cooking and tagged dutch taco, taco cleanse, waffle taco on September 26, 2013 by lazysmurf.